Monem ship, has been completed in Germany in 1956. Her length was 60 meters and beam was 13,5 meters. Monem ship, was a very priceless gift for the Cesme. After completing her economical life, Monem sunked near Esek island near Cesme while she was being taking to Aliaga for scuttling in the November of 2004. The depth of the site is 18 meters. 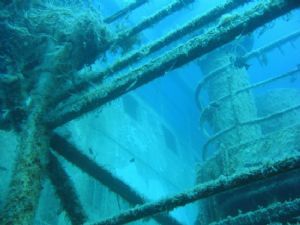 The reason of this ship, being a gift to Cesme was in that time the local dive schools were trying to sink a ship in order to make an artificial reef out of it. But it was soo expensive. 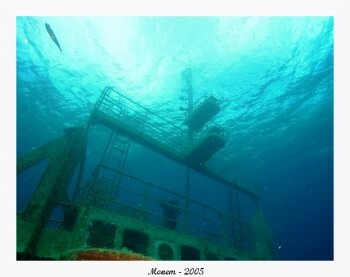 With Monem being sunk, Cesme has owned her artificial wreck at a very divable depth. First you dive from the bow of the wreck and continue to the stern of the wreck from 17,18 meters depth. When you reach to the stern, you pass near of the propeller and the rudder part. Then you can ascend from the stern while looking through the holes in to the ship. One floor above the deck level, there is an area that can take up to 20 divers. Following the stairs to up from here, you will find the captain's control room. This room has two doors so exit can be made through the other door. After that you can see the storage rooms on the front deck while passing on them from 8,9 meters. Before finishing the dive you can make your safety stop near the chimneys at 5 meters depth. Marine life is changing everyday. But you shouldn't forget that because of her sinking day is very close, marine life is not so much at this time. But same as all other artificial reefs, with time the marine life grow much much more and Monem will beccome a great diving spot. The Photographs have been taken by Aziz Saltýk.